It’s that time of year to dust off the Christmas songs and get into the holiday spirit! In this lesson, you learn a chord melody or solo fingerstyle rendition of Jolly Old Saint Nicholas. This means you play the chords and the melody of the song at the same time! In the following video, take a listen to Jolly Old Saint Nicholas now. In the next video, I present some tips for learning how to play this song as well as play a slower version of the song counted out loud, so you can see exactly what my fingers are doing. 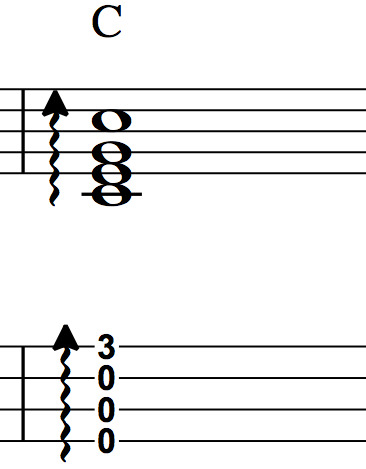 Before that though, you’re going to want to download the ukulele tab. Download the ukulele tab and sheet music for Jolly Old Saint Nicholas. In the style of solo fingerstyle, you fingerpick and strum the melody and chords of the song to play a solo piece. In this style, I recommend using the thumb to pick and strum the strings. In the music, down strums are indicated by a squiggly up arrow in the ukulele tab, as indicated in the following figure. Use the thumb to strum down across the strings. There are three steps to learning a solo fingerstyle piece like this one. The first step is to look over the sheet music and ukulele tab for the song. You might take out a pencil to make notes. Pay specific attention to the chords required to play the song. See if there are any repeated sections. Identify where on the fretboard most of the song is played. These are some of the things you want to look for. The second step is to divide the song up into small sections and practice the song a section at a time. What you often find with solo fingerstyle pieces like this one is that they take longer to learn than a song you’d normally strum. This is why it’s important to break up the piece into small four to eight measure chunks. This makes learning the song more fun and rewarding! Once you can play through each section of the song, then, it’s just a matter of playing through the song in one sitting. It’s okay if you make mistakes. As you play through, you might find that one part in the song will require some more practice. That’s quite alright. Go slow at first and you’re sure to see success!